The other day a man knocked at the door. His great grandfather had been born here in the cottage back in 1846. He told me what he knew about the place and its history. Apparently, many years ago, a body lay on top of the woodpile to the left of fire where my desk now sits. Local fisherman had found the drowned soul in the sea and brought him to the nearest dwelling. It was fascinating to hear the tales and find out about the people who, like me, called this cottage home. Lives lived and lives lost. In a strange way, they’re still here in each carefully placed stone and worn floorboard. I imagine how on a stormy night they too must have listened to the wind howling outside, safe and protected by these four walls. The cottage before we took it back to the original stone. I’ve no idea how old the cottage is – two hundred years perhaps? When we repointed the walls this summer we chipped away the years and caught a glimpse of the folk who built it. The cornerstones – great hulks of rock – glittered in the sunshine, no different from the day they were hauled from the shore and placed here by someone strong and skilled and determined to make a home. And still this cottage stands. 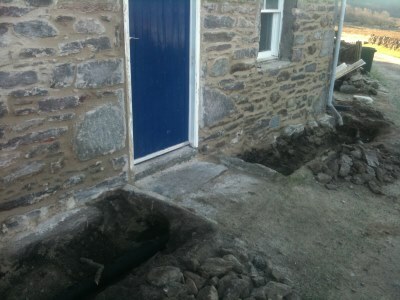 The whitewash is blasted off, the walls are repointed and a ‘French drain’ is dug… the work begins. But it does need some work. It’s cold in the winter before the fire gets going. Damp yellows the walls and creeps into the bedding. And there’s a baby on the way, so I need to make things a little more modern. The architect has come up with a plan. 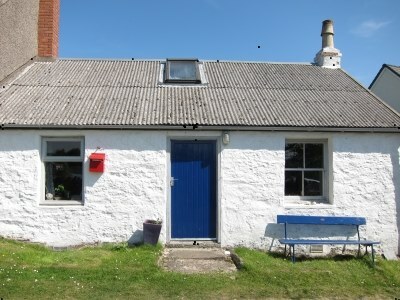 The original cottage is going to be renovated and a wood-clad extension built on the back. I can’t wait. I’m also slightly nervous. I want to be true to the building and its people. It’s been handed into my keeping and will be passed on again, no doubt. We’re starting from the right place, I think. Rather than trying to apply modern standards we’ve been looking at how the cottage was designed to work. So we’ve repointed with lime mortar. Instead of damp-proof course we’re looking at drainage. There will be change but the essence of the cottage will remain. Memories are woven into its fabric and we’re just threading a few more. Love the way you have snuck the munchkin in between the damp and extension…..! Eve both Eric and I know that the extension to the original cottage will be perfectly in keeping and sympathetic to its origins that are steeped in history, all the very best for the months to come at this exciting stage in your life. I like that Eve. If building could talk, the things they’ve seen! !